Is Hortonworks Being Unjustly Punished for Cloudera's Sins? Is the big data market slowing down, or are the spoils just going to different places? Hadoop, along with its related architectures, is open-source technology that enables the processing of vast amounts of data. While the technology is relatively new, the emerging industry surrounding it could be big: IDC estimates the markets for dynamic data management, content analytics software, and advanced analytics software will reach $22.1 billion by 2020. Also enticing for investors: There are currently only four players that sell these specific big data tools, two "pure plays" -- Cloudera (NYSE:CLDR) and Hortonworks (NASDAQ:HDP) -- private company MapR, and Amazon's Elastic MapReduce. Over the past 12 months, Cloudera and Hortonworks' revenues were just under $400 million and $300 million, respectively, meaning there could be a very long runway ahead. Recently, however, a curious thing has happened: Cloudera's revenue has slowed, dragging down not only its own stock, but also that of competitor Hortonworks. In fact, at the time of this writing, Hortonworks stock is down roughly 13% so far this year while Cloudera's stock is down about 6%. This is despite Hortonworks continuing to post strong numbers in 2018. Is there something wrong in the big data market, or is Hortonworks being unjustly punished for taking market share? Ever since its IPO last year, Cloudera seemed to have been the favored company. Cloudera historically wrote proprietary software on top of the open-source Hadoop framework for enterprise-specific applications, while Hortonworks was more of a "pure" open-source company, selling services and support subscriptions to help data scientists implement the technology. The market has long preferred Cloudera's model, granting it a higher price-to-sales ratio than Hortonworks (both companies are unprofitable so a price-to-earnings ratio is not available), even though both play in the same market. I actually prefer Hortonworks' business model, and recent results have gone Hortonworks' way. 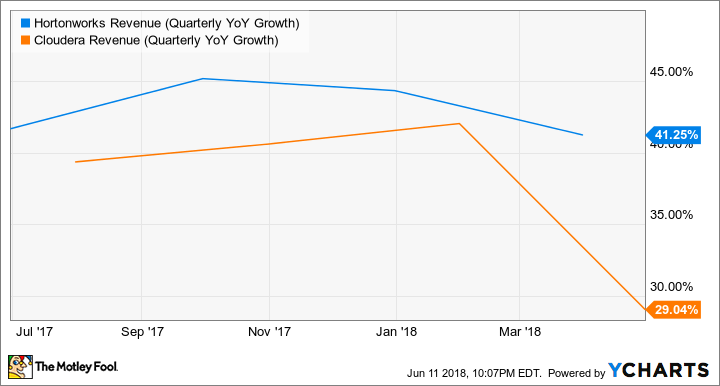 As the calendar turned to 2018, Cloudera's revenue growth rate significantly decelerated, going from the low 40% range all the way to 29% in the past quarter, while Hortonworks has continued to grow strongly, notching 41% revenue growth in the first quarter. Cloudera has admitted to having to refocus its sales model. On the last earnings call, management said it hired three new general managers and would focus on selling only to customers that were likely to greatly expand usage over time. While the company used to list how many Global 8000 customers it had, it has stopped doing so, defining its new addressable market as about 5,000 enterprises -- a list that is perpetually shifting. To be fair, Cloudera is still disclosing how many customers are on a $100,000 annual run rate. Those customers tend to be "stickier" and make up 92% of Cloudera's revenue. Still, investors haven't been pleased with changing disclosures or the lowering of the near-term addressable market. Is it the market, or market share? We have no problem competing with our traditional competitors called MapR, Hortonworks, the Hortonworks plus IBM partnership ... Our cloud win rates are not as high as those traditional win rates, but we think our focus and our capabilities to take it directly to the cloud guys and to take our customers to the cloud quickly, we'll see our win rates improve there. Clearly, Cloudera is confident, though investors should know that Hortonworks is actually a partner to the cloud vendors, licensing its platform underneath the cloud players' software layers. For instance, Hortonworks recently renewed its contract with Microsoft, which sells a big data offering called HDInsights, a software product that uses Hortonworks as its underlying platform. So it's possible competition from "cloud vendors" is also partly going to Hortonworks. I'm still a believer in the industry, and Hortonworks specifically, but an investment is not without risks. 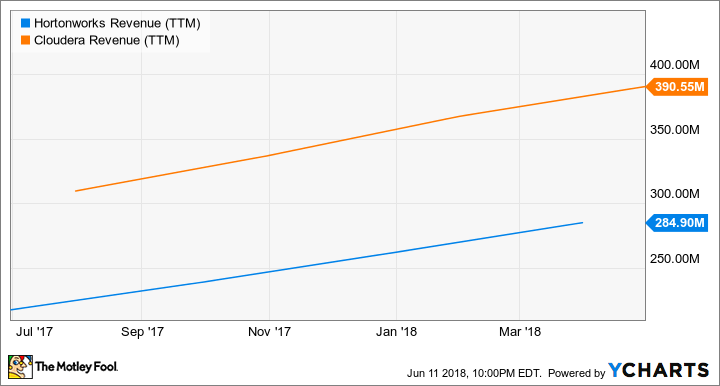 Earlier this year, Hortonworks guided for deceleration to just 26% growth in 2018 (30% when accounting for the ASC 606 accounting change), so it's possible Hortonworks could be in for a large deceleration as well. Still, Hortonworks started off 2018 strong, beating Q1 revenue estimates handily and raising its full-year revenue outlook from $322 million to $327 million to $325 million to $330 million. The company also has a history of being conservative. In addition, despite Cloudera's large April pullback, it still trades at a premium to Hortonworks on a price-to-sales basis (5.5 times vs. Hortonworks' 4.2 times sales). Those are still relatively low P/S ratios for high-growth software companies, and for those looking to ride the big data processing wave, I'd still advocate Hortonworks over Cloudera -- though I'm watching developments closely.